And yet again, thanks to Mr Lion at Absinthe.de, I had the chance to sample another absinthe. The Lemercier Abisinthe 72 is acutally very nice. It is almost totally clear with just the slightest tinge of yellow. It smells very smooth, although it's at such high alcohol level. Tasted neat it sure burns and it's got a good bit of heat, but that mellows out into a nice herbal mixture. With water and sugar added it produces a nice white louche, and the taste smoothens even more. 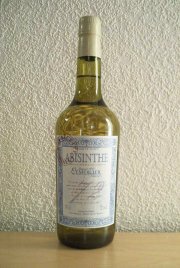 Despite its high alcohol level one could use less water than for many other absinthes, since too much water flattens the taste way to much. I think this is a very good absinthe, and it's one of the kinds that I would definitely treat any "beginner" that have never tasted absinthe. So. It's quite appealing and I sincerely recommend it. It's nothing out of the ordinary, but it's way ahead of any oil mix available.